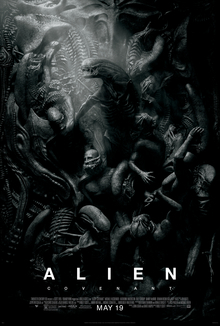 The latest film in the ‘Alien’ series is both prequel (to the original 4 films) and sequel to 2012’s ‘Prometheus’, a film I liked a lot despite its flaws. I feel much the same way about ‘Alien: Covenant’, a film where many things don’t work, but I am relatively happy to overlook these flaws because the things that are good are really good. The film focuses on a colonisation ship called the ‘Covenant’ as it heads for a far off planet to start a new human settlement, when an incident happens that wakes up the crew members from a deep hyper sleep. This incident is compounded by the death of the previous captain, promoting Billy Crudup’s Oram to a leadership role, and the detection of a faint signal coming from a closer planet that the crew choose to investigate. It doesn’t take a genius to work out this investigation will not end well. The film takes its time to get going and many of the key incidents or deaths require a monumental level of stupidity from the characters, which feels disappointing from a man with such experience in filmmaking as Ridley Scott. I also struggled to get on board with the overarching story and the additions to the ‘Alien’ lore that the film explores, and much like ‘Prometheus’, it’s becoming clearer and clearer that Ridley Scott fails to understand his creation (a concern with his ‘Blade Runner’ sequel due in cinemas later this year). It also introduces a variety of characters who, with the odd exception, are thinly characterised and their motivations are mainly driven through writing several of the crew members into long term romantic relationships with one another. That being said, I thought Danny McBride was great away from a traditional comedic role, and I thought the twitchiness displayed by Billy Crudup and Katherine Waterston helped to establish a sense of tension and suspense that I really got on board with. However, let’s talk about what was really good and what really sold it to me. There are a couple of things but it would be hard to start anywhere but with Michael Fassbender, who carries the film in dual roles as androids David (who we first saw in ‘Prometheus’) and Walter, a new android accompanying the Covenant. He manages to make both androids distinct creations, yet embedding the same DNA within them, and his shifting eyes and penchant for artistry is both beautifully poetic and creepy in an otherworldly sense. The way the characters are written is not always on point but Fassbender is so magnetic in the roles that I was happy to go along with it. I also felt the film excelled once it had established its narrative, particularly in the way the action sequences were assembled and in the use of gore that harkened back to many of the series high points without feeling entirely like a copy. Once the film gets into its groove I loved the atmosphere that was created through a combination of Scott’s visual styling and the stunning score from Jed Kurzel, and I was really taken by it. The more I think about ‘Alien: Covenant’, the more I think I liked it, and I felt this was a strong entry in the overall series, even if it doesn’t take the franchise in any innovative new directions.